C an you spell Fiesta? September events in San Miguel de Allende revolve around the fiestas patrias, and this is when sanmiguelenses really like to party hearty. The month combines Mexican Independence Day, the local Feast of San Miguel, the Alborada, and the famous Sanmiguelada, our home-town, small-town version of Pamplona, Spain's running of the bulls. It brews up into a heady mix that'll have you ready for a long autumn snooze to sleep it all off. Parades, music, patriotic fervor, dancing in the streets, men falling from tall poles with ropes around their ankles, bulls, beauty queens, and fireworks, fireworks, fireworks! September's got it all! Since the activities come thick and fast and locals are always thinking up new ways to celebrate, check the "¿Que Pasa?" pages of Atención San Miguel for a complete list of activites and exact times and locations of all September events in San Miguel de Allende. 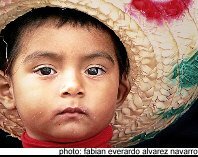 September 13 - The festivities begin on a low key, with civic ceremonies to honor the Niños Heroes, the boy heroes. This group of six young military school cadets in Mexico City defended themselves and Chapultepec Castle against invading U.S. troops in 1847. As defeat drew near, rather than surrender to the Americans they wrapped themselves in Mexican flags and leapt to their deaths. This San Miguel event honors them as martyrs. September 15 - The Grito. 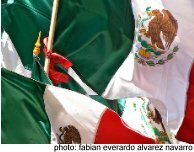 This is the most patriotic moment in the Mexican year, when Mexicans embrace their history, their country, their flag. It's the most important of September events in San Miguel and in all of Mexico. Great patriotic fervor goes into celebrating this reenactment of the famous "shout" of independence first given by Father Hidalgo in 1810 in Dolores Hidalgo, about 25 miles from San Miguel. Flags are everywhere and banners hang from the buildings. Many people paint green-white-and-red stripes on their faces. The crowds begin pouring into the Jardín by late afternoon or early evening. A runner bearing a torch arrives at 11 p.m. Then the Mayor recites Father Hidalgo's proclamation of independence from the balcony of the Allende House, on the corner of the Jardín. Every few seconds, the throngs below respond by shouting "Viva!" This same scene is being played out in this same way at this very moment in every town and city in Mexico. This is THE September event in San Miguel and everywhere in Mexico. It ends with one of the biggest fireworks displays of the year (which, in San Miguel, is saying something). Kids and young men don huge, wide-brimmed sombreros to protect themselves from the falling sparks and dance under the fiery showers from the castillos. Celebrations continue pretty much through the night. The absolute best (and by far the most comfortable) way to watch the Grito and the ensuing fireworks display is from the upper floor or roof of a building right on the Jardín. If that's not feasible, arrive early and don't plan on going home early. The square will be sardine-packed. No one gets out until everyone gets out. September 16 - The party continues today with parades, conchero dancers in their colorful costumes and long-plumed headdresses, more fireworks, a charreada (a sort of Mexican rodeo) and a bull fight at the bull ring on Recreo. There will also be live music, the beauty queens will preen, and a lot more flags will wave. One of the most famous—or perhaps "notorious"—of all September events in San Miguel de Allende for many years was the Sanmiguelada or the Pamplonada, San Miguel's own "running of the bulls." This festival was something of a poor copy of the famous "Running of the Bulls" in Pamplona, Spain. The streets around the Jardín were blocked off with barricades and several young bulls set loose inside—along with what seems like half of the young, male population of Mexico, mostly dressed in the traditional white shirts and red bandanas, and mostly drunk on too much beer and tequila and machismo.. The atmosphere was pretty much a cross between Spring Break and St. Patrick's Day in New York City. The sanmiguelada had been bringing up to 20,000 visitors to San Miguel for the weekend, creating good business for hotelkeepers and restaurants. But in 2006, the crowds exploded to some 50,000 young visitors. Violence broke out, ending in gunshots that wounded two young men. The clean-up task left for the city was massive...and expensive. In mid-2007, the City Council asked the hotel and restaurant-owners organization to agree to foot part of the bill for extra security and clean-up. They refused to do so and the city announced that the sanmiguelada had been canceled, permanently. September 22 - The Autumnal Equinox, the official beginning of Autumn. There is usually a celebration to mark the event at El Charco del Ingenio, the botanical garden at the southwest edge of town. Weekend after September 29 (October 3-5 for 2008) - The Feast of San Miguel Arcángel. This September event is San Miguel de Allende's very own party, the saint's day for our own patron saint. Unlike the grito, this feels like a big family party. It's for the locals. It doesn't draw flocks of tourists from far-flung places, but families come into town from the campo to enjoy the holiday. On the nearest Friday, everyone stays up all night for the Alborada, which roughly translates as something like "to attack the dawn." At 3 a.m. the larger-than-life puppets known as mojigangas arrive in the square. Around 4 a.m., another monumental fireworks display begins, featuring several castillos. 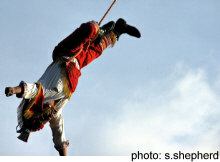 The famous Voladores de Papantla, the Papantla Flyers, set up their pole in the esplanade in front of the church and perform their gut-wrenching feat several times throughout the weekend. This involves five men climbing to the top of the pole. Four of them attach themselves to ropes while the fifth stands on a tiny (like 12" square tiny!) platform at the very top and plays a flute. The other four fall off the top and slowly spin on the ends of their ropes until they reach the ground. It is graceful and lovely to watch, and the voladores' performances are always among the most popular of all September events in San Miguel de Allende. It's the happiest party of the year.